Sporting legend and Commonwealth Games England President, Denise Lewis OBE, helped launch Team England’s partnership with npower, who are encouraging the nation to show their support for the team in this year’s Commonwealth Games. With exactly 10 weeks to go until the opening ceremony of the 2018 Commonwealth Games in Australia, Denise launched npower as Team England’s Official Partner with pupils from Dorrington Academy School, Birmingham. The school is in the shadows of the Alexander Stadium, which will be a host venue for the 2022 Commonwealth Games in Birmingham. Local company npower, a large employer in the West Midlands, have been generating excitement in the region as the countdown to the 2018 Games begin and are aiming to inspire the public to give Team England the Power of Support, to drive the team to their most successful away Games yet. Denise, together with Commonwealth Games and Paralympic gold medalist Dan Greaves, spent the morning teaching pupils about the Commonwealth Games before putting them through their paces in the gym/on the pitch. 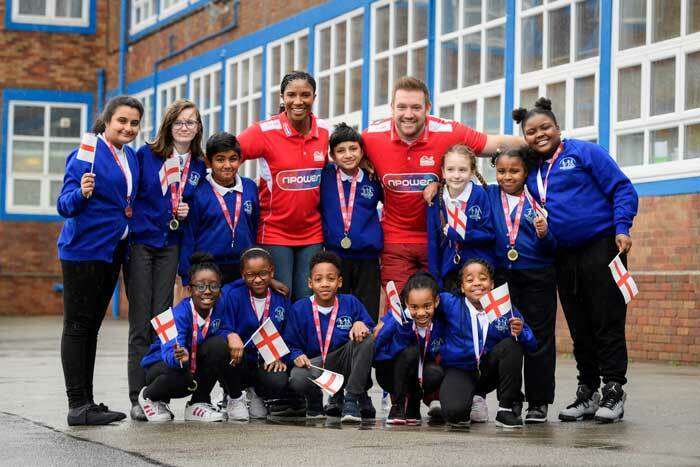 “It has been a fantastic day and has created such buzz among the children having gold-medalists Denise Lewis and Dan Greaves here. Not only have the children learned about why the Commonwealth Games is unique, they have also learned how significant a role they can play through giving their support to Team England. npower will be an Official Partner of Team England across the 2018 Commonwealth Games on the Gold Coast, Australia and will be launching some exciting plans over the coming weeks. Superhero Series and our partnership with Commonwealth Games England raises this to another level.